eFilmCritic - DVD/Blu-Ray Reviews for 11/7: "Arise My Wives! And Hear The Will Of Manos!" DVD/Blu-Ray Reviews for 11/7: "Arise My Wives! And Hear The Will Of Manos!" For various reasons that we need not go into at this time, the semi-regular DVD/Blu-Ray column that I do has been a little more semi as of late. This, I promise/threaten, will be amended very soon. Until then, here is a brief update of a few of the more notable new titles on the horizon to satisfy your home video needs. 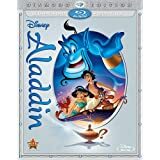 ALADDIN: DIAMOND EDITION (Buena Vista Home Entertainment. $39.95): Though I would not exactly rank this 1992 blockbuster as one of the great Disney animated films, it is an undeniably popular title and its massive fan base should get a kick out of the special edition that has been put together in honor of its Blu-Ray debut. Many of the bells and whistles on display here have been seen in previous editions but it makes up for it with a tribute to the late Robin Williams--whose still-astonishing turn as the Genie gave the film its juice--that includes a number of outtakes of him recording his part and, not surprisingly, going off on bizarre and frequently hilarious tangents. If you have kids, this is pretty much a must-own and if not, it is still pretty much worth a look. 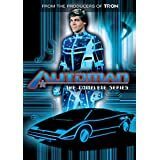 AUTOMAN: THE COMPLETE SERIES/MANIMAL: THE COMPLETE SERIES (Shout! Factory. $26.99 each ): Proving that pretty much every television show from the 1980s that lasted more than three episodes will one day get its own DVD collection (with the apparent exception of my beloved "Strike Force"), these two short-lived productions from veteran producer Glen Larson get their long-awaited due. Essentially an inversion of "Tron," the former in a 1983 series in which Desi Arnaz plays a police department computer nerd who devises a hologram policeman (Chuck Wagner) that can help him solve the crimes that those pesky flesh-and-blood cops can't be bothered with. If that premise seems a little too staid for you, perhaps the latter title is more up your alley. 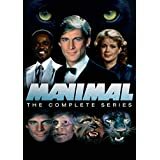 It follows the adventures of a hunky criminology professor (Simon MacCorkindale) with the power to transform himself into any animal (at least those that could be achieved within the show's budget). Rather than looking up Nastassja Kinski for a bit of fun, he uses these powers the way we all would--to help the NYPD solve the crimes that those pesky biped cops just can't be bothered with. Both shows are ridiculous, of course, but those with a taste for this brand of cheese will probably be entertained. Now bring on "Mr. Smith," dammit! CODE UNKNOWN (The Criterion Collection. 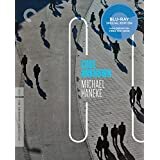 $39.95): Michael Haneke wrote and directed this painful and wounding drama (were you expecting a wacky rom-com?) that uses an incident involving a homeless man and a pastry on the streets of Paris as a springboard to examine the malaise and disconnect running rampant throughout contemporary Europe. With its numerous storylines bouncing off of one another, it is sort of like his version of "Short Cuts" and while it is not exactly my favorite of his films (I prefer the likes of the original "Funny Games," "Cache" and "Amour"), it is formally inventive (it consists almost entirely of a series of long extended takes), beautifully directed and filled with a number of strong performances. Those who admire it more than I do--and there are many of those people out there--will dig this edition, which includes such special features as an introduction filmed by Haneke in 2001, an interview with him from that time discussing one of the film's key sequences and "Filming Haneke," a 2000 making-of documentary featuring interviews with Haneke, producer Marin Karmitz and co-star Juliette Binoche. THE GREAT AMERICAN DREAM MACHINE (S'More Entertainment. 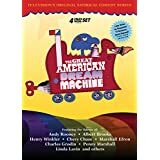 $39.98): In the years between the demise of the Smothers Brothers show and the arrival of such landmarks programs as "Saturday Night Live" and "SCTV," this show, which aired on public television between 1971-1973, kept satire on the airwaves and helped to foster a new generation of talent as well. Among those who got early exposure through the show include such future stars as Chevy Chase, Albert Brooks (who offered up his hilarious "Albert Brooks Famous School for Comedians"), Charles Grodin, Henry Winkler, Penny Marshall and Martin Mull and also included appearances from the varied likes of Andy Rooney, Studs Terkel and Evel Knievil. As a time capsule of a tumultuous era of American history, the 12 hours of sketches presented here are invaluable and many of them still hold up surprisingly well today--at the very least, there are more laughs here than "SNL" has accomplished in the last couple of years. MANOS: THE HANDS OF FATE (Synapse Films. $24.95): Yes, the infamous 1966 shlock classic from fertilizer salesman-turned-auteur Hal P. Warren--a tale of an ordinary family whose wrong turn while on vacation leads them into the clutched of a bizarre cult consisting of the satanic Manos, his zombified harem (who still manage to get into the occasional catfight) and, of course, his oddly gaited aide-de-camp Torgo, a character who has to be seen (and heard) to be believed--has made its long-awaited arrival on Blu-Ray at long last. That in itself would be all kinds of astonishing but it has in fact arrived in a fancy special edition that almost certainly cost more to produce than the film itself, even after factoring in inflation. The film itself has undergone a full 2K restoration and while it still looks like crap, it is light years better than the muddy PD copies that have been floating around for years. (To prove how much it has been improved, the Blu-Ray also includes a copy of the unrestored version so that viewers can see the difference between them.) There is a commentary track featuring Manos himself, Tom Neyman, and his daughter, Jackey Raye Neyman-Jones, who played the adorable little girl, who provide amusing memories about the making of the film and their disbelief in its current cult status. Finally, there are three featurettes that offer looks at the history and afterlife of the film, how the restoration came about and a woman who has made it her mission to stage the film as a puppet show. Every man, woman and child should see this film, of course, but for trash film aficionados, this disc is essential. TERMINATOR: GENISYS (Paramount Home Video. $29.99): Having already scraped the bottom of the proverbial barrel with "Terminator: Salvation," the once-peerless franchise hits new depths with this bit of nonsense that tries to revamp things with nonsense involving alternate timelines that comes across like an exceptionally bad bit of fan fiction written in a Mountain Dew daze. Arnold Schwarzenegger returns in his signature role but he seems as bored with the proceedings as the audience, Emilia Clarke does not get a chance to demonstrate any of the fire or power that she does on a regular basis on "Game of Thrones" and franchise-killing lunk Jai Courtney is such a drag as the human hero that you will be rooting for the robots to win once and for all. Frankly, the only surprising thing about the film is that the Blu-Ray package features a quote from James Cameron himself stating "You Are Going To Love This Movie"--God only knows how much he was paid to deliver that endorsement. TOMORROWLAND (Buena Vista Home Entertainment. $29.95): Going into last summer's box-office derby, this hugely expensive film was arguably the biggest question mark of the bunch in that no one seemed to have much of an idea of what it was supposed to be. However, with the combination of co-writer/director Brad Bird (the guy behind such wonderful films as "The Iron Giant," "The Incredibles" and "Mission: Impossible--Ghost Protocol") and star George Clooney, it at least seemed more interesting than most of the formulaic sequels it was up against. 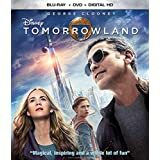 Alas, it proved to be one of the biggest disappointments of the season, both commercially and creatively, as the confusing story of a brilliant but rebellious girl (Britt Robertson) who stumbles upon a magical future world known as Tomorrowland and seeks the help of another former visitor (Clooney) to help her return. In a time when most film financiers are getting increasingly conservative in regards to the kind of projects they are willing to finance--preferring seeming sure things to anything that even vaguely smacks of potential risk--I am glad that Bird was able to get the money to bring his vision to the screen but I just wish that the final result could have meant as much to viewers as it evidently did to him. Bird does appear in the special features section to explain his reasons for making the film and there are the usual array of deleted scenes, featurettes and even a new animated short for good measure. DVD/Blu-Ray Reviews For 7/12: "The Whip Is Cracked!" DVD/Blu-Ray Reviews For 3/23: "I Am The Wrath Of God! Who Else Is With Me?" DVD/Blu-Ray Reviews For 2/24: "If It Weren't For Venetian Blinds, It'd Be Curtains For Us. . ."
DVD/Blu-Ray Reviews For 1/29: "The Results Of Our Anti-Ugliness Drive Were Less Than Satisfactory "